It has been exciting reading your posts of your first reactions to Rondo 2. Now that you have had Rondo 2 a little while, how are things going? Do you find yourself using Rondo 2 mostly or using Sonnet mostly? Why? 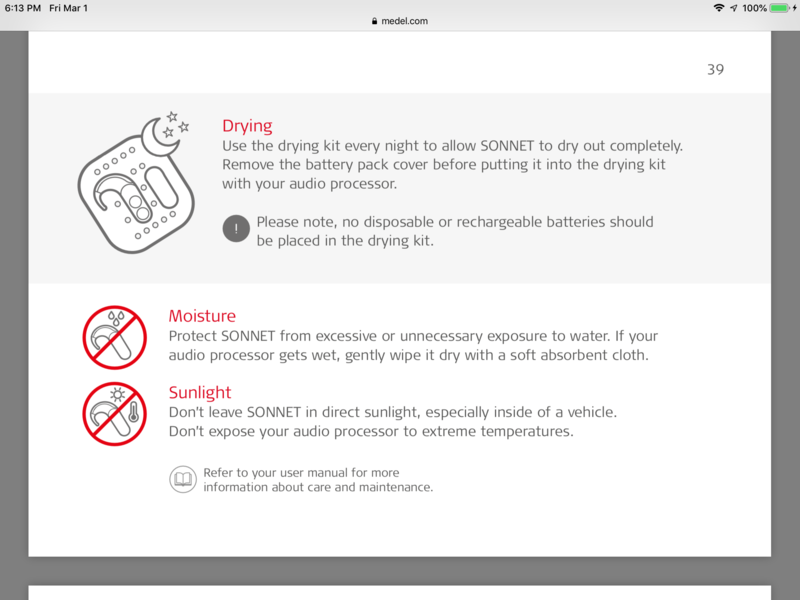 I still use Sonnet mostly, I like having the option of going to Adaptive at work. But I switch to Rondo2 at home and wear them when I exercise. I have to get my audiologist to turn down the Rondo2 volume again. We did it last time but they're still louder. Those babies get some VOLUME. The cool thing about using the Fine Tuner to decrease volume is that the Rondo 2 should power up again at the same settings you used when you turned it off. The other Med-El processors do that. So if you find your sweet spot for volume (certain number of decreases on the Fine Tuner) you should be able to stay at that level. @MED-EL Moderator Does the Rondo 2 start up at the same settings (including volume) that it was set to when it turned off like our other processors do? @Mary Beth, I think it does. I'm just looking to have the default program at about the same volume I'm used to with the Sonnets. I actually turn the Rondo2 up for left-side only rehab when I'm on the treadmill! But for normal use with both CIs, man, it's loud. I would love to see the default MAPLAW setting in the Rondo 2. MAPLAW impacts soft sounds. It changes how much louder soft sounds are made. OPUS 2, Rondo 1 and Sonnet have default MAPLAW of 500. Our audiologists can change this. Mine are set at the default MAPLAW of 500. When do you return for another MAPping? yes, the RONDO 2 starts up with the same settings it was set to before turning off. My next appointment is February 6. It's a longer one, and we'll be doing a bunch of testing. I think that rather than just ask to turn down the overall volume for the Rondo2s again I might ask for a separate MAP. Great idea @Mary Featherston! My ASM 1 processors have separate MAPs from my ASM 2 processors. That works best for me. Good luck! After I got my Rondo2 mapped, I wore it and Rondo 1 together. I enjoyed the comfort and ease of use. Plus I went 3 days before I changed battery in the Rondo 1. Recharge Rondo2 nightly. However, I missed the ASM2 features of dual mics in the Sonnets. So I switched back to wearing Sonnets exclusively. well I found the restaurant experience distasteful hearing wise. I missed the ability to use the FineTuner to bring Sensitivity down 5 clicks and volume down 2-3 clicks. That always seems to work best for me with the Roger Pen. my AuD gave me a program to do similar, but my experience has had better results manually. Is that clear? Did I state that ok? If you sync your Rondo 1 and Rondo 2 to your Fine Tuner, you should be able to manually adjust volume and sensitivity just like on your Sonnets. Right? i may be able to adjust volume and sensitivity for the Rondo2/Rondo1, however the ASM1 of those processes is limited compared to the ASM2 of the Sonnets. The ASM2 and dual mics allow me to adjust sensitivity and volume in a way that makes noisy situations like restaurants easier to live with. Those combinations with dual mics allow me to hear better the voices at my table and when I include the Roger Pen or Select I am able to hear and converse tremendously better. I was told by a MedEl rep that the sensitivity with ASM2 focuses the mics from 180degrees to a narrower setting, focusing hearing to the table I am sitting at. Dropping volume allows me to minimize background noise. Using the Roger Pen in conference mode (lying flat on the table), or pointing it at an individual speaking allows me to hear the conversation quite well. when I leave the restaurant, I have to remember to get the reset button! I am glad you have a routine down pat that helps you hear well in noisy restaurants. A lot of people struggle to find out what works best for them in noise. It takes patience and trial & error to figure this out sometimes. I would think that anyone who prefers the natural or adaptive settings on Sonnets (which use dual mics), may find themselves feeling more comfortable with the Sonnets than the Rondo 2s. I prefer omni mic setting in the Sonnets so I would not miss the dual mics of the Sonnets. It is great that we have so many options. Last week I used the Sonnet mostly as I had several meetings conference room style so I wanted to use the Roger Pen. I went back to the Rondo2 on Friday. I find that if I wear the Rondo2 for several days and then go back to the Sonnet, it takes a while for my brain to get used to the Sonnet. By that I mean the sounds don't sound as clear and crisp as the Rondo2. It may be due to the Rondo2 being at a higher volume. I guess I need a further bumping up of the volume on my Sonnets. I'm curious whether others are having the same experience as me. Does the same thing happen when you go from wearing the Sonnet for awhile and switch to the Rondo 2? Or are you just hearing better with the Rondo 2 and switching back to it is easy? you can use the same Roger Pen with Rondo 2 by using the Roger MyLink neckloop receiver and switch to MT on your Fine Tuner. That neckloop receiver has a volume control dial so you can easily adjust the volume from the Roger Pen. When I wear the Sonnet and then change to the Rondo2, it takes maybe 10-15 minutes to adjust. At first it feels like the Rondo2 needs to be in a dryer. But after that I'm pretty fine. I find that with the Rondo2 I hear my 2011 TV ok. With the Sonnet I have to use the Roger Pen with the TV but with newer TVs I can hear well without the Pen. I remember what you shared about the Roger MyLink but I'm not ready to buy anymore accessories right now. Just trying to make the most of what I have already! Too many holes in my pocket! Lol! Rechargeable batteriescan not go in a dryer and Rondo 2 has a built in rechargeable battery. It is also a sealed processor so no moisture can get inside. 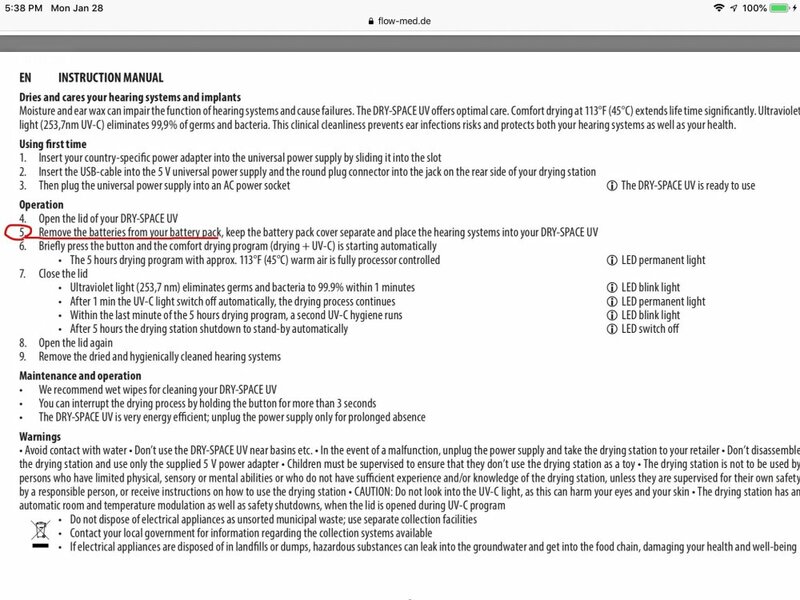 Med-El shows the disposable batteries in the dryer in their quick manuals for several processors but I have also read FB posts from Med-El suggesting not to do that. Med-El now instructs us not to place disposable batteries in dry kits! Picture removed because Med-El changed the instructions. Med-El now instructs us not to place disposable batteries in dry kits. Ha. Don't expose my processor to extreme temperatures. The forecasted high temp on Wednesday is expected to be -18. Rondo 2 default MAPLAW is 500, the same as our other processors.